Biting and scratching is a cat's natural form of defence so that's how they will let you know if you've hurt them or made them anxious. 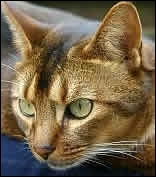 Some cats however will bite or scratch as a result of over active play which is linked in with their natural instinct to hunt. Cats and kittens just love to pounce on dangling or moving objects but it's important to teach them the boundaries when excessive scratching and biting develops. If your cat or kitten is getting over aggressive during play you should stop the activity to let it know its actions are unacceptable. There are dozens of methods which have been used over the years in the quest to discourage hissing, biting and scratching. These have included a quick squirt from a water spray, clapping and sharply saying 'no' to a cat or kitten. However, often the best results can be seen over a period of time by rewarding your cat or kitten for good behaviour with the affectionate praise and the occasional treat. Sometimes a cat will suddenly turn and hiss or bite during patting or stroking. It may enjoy the activity up to a point before suddenly deciding enough is enough. Signs that a cat may be about to bite can include sharp backward motions of the ears or a flick of its tail. Often it's just a case of learning to tune into your cat's moods and behavioural traits. territory is being invaded by another animal or person. Some cats can become easily frightened and their posture will usually let you know when they are scared - this may include crouching on the floor with ears back, tail tucked and a slight roll to the side. Many cats will display aggressive behaviour when they are ill so a trip to the vet may be the best course of action if your pet suddenly starts to show more aggression than normal. As with children, it's best to start developing good behaviour in your cat when it is young. Familiarising it with regular touching and stroking from an early age is likely to increase its tolerance to other animals and strangers in later years. No two cats are the same in nature so it's a fact of life that some will be more likely to bite and scratch than others. There are many good books available on cat behaviour which can help you learn to understand your pet more and therefore discover ways to reduce the amount of biting and scratching.